Transparency Market Research (TMR) has published a new report titled, “Pharmaceutical Waste Management Market - Global Industry Analysis, Size, Share, Growth, Trends, and Forecast, 2018–2026”. 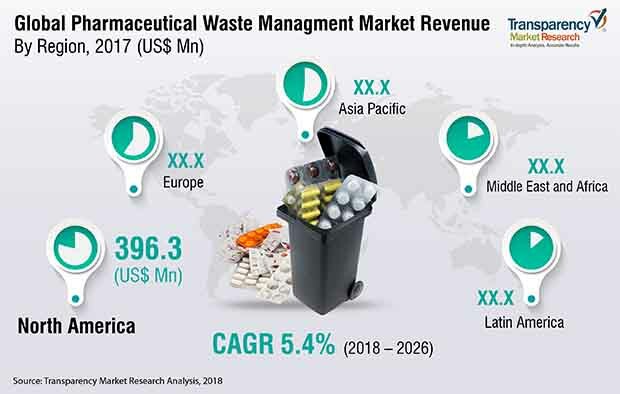 According to the report, the global pharmaceutical waste management market was valued at US$ 1,018.2 Mn in 2017 and is anticipated expand at a CAGR of 5.4% from 2018 to 2026. Growth of the pharmaceutical industry, government initiatives, increase in health care expenditure, and rise in awareness are likely to fuel the global pharmaceutical waste management market from 2018 to 2026. Pharmaceutical waste management is a critical issue across the world. In order to ensure safety from hazardous waste, several government organizations such as the Food and Drug Administration (FDA), the Environment Protection Agency (EPA), and the Drug Enforcement Administration (DEA) have introduced various programs for proper waste disposal. For instance, in April 2016, the Drug Enforcement Administration (DEA) hosted the 11th National Prescription Drug Take-back Day. The program was aimed at providing a safe and convenient means of disposal of unwanted, controlled substance prescription drugs. Factors such as rapidly growing health care sector in developed and developing economies, rise in research and development activities for the discovery of new pharmaceutical molecules for treatment of chronic diseases, and rapidly growing pharmaceutical industries across the world drive demand for pharmaceutical waste management. According to the Environmental Protection Agency (EPA), the U.S. is the leading producer of medical waste in the world. Increase in number of community pharmacies in Europe is expected to drive the pharmaceutical waste management market during the forecast period as all unused medication are returned to local community pharmacies for disposal. According to reports published in 2016, there are approximately 160,000 community pharmacies in Europe. The cost of pharmaceutical waste disposal in higher than the cost of manufacture in many developed and developing countries. Factors such as high cost required to build the facility, cost of land for dumping the waste, expensive waste collection vehicles, and equipment used for disposal of pharmaceutical waste restrain the growth of the pharmaceutical waste management market. In terms of revenue, the pharmaceutical waste management market in Asia Pacific is projected to expand at a CAGR of 5.9% during the forecast period. Rapidly aging population in the region is expected to boost demand for pharmaceuticals for the treatment of various diseases, which in turn is likely to fuel the growth of the pharmaceutical waste management market during the forecast period. According to the United Nations, China’s geriatric population is projected to double from 10% to 20% between 2017 and 2037, and estimated to reach 44% by 2050. The report also provides profiles of leading players operating in the global pharmaceutical waste management market. These include Stericycle, Waste Management, Inc., BioMedical Waste Solution, LLC, Daniels Health, Stryker, Covanta Holding Corporation, and Cardinal Health. Increase in merger & acquisition, strategic collaborations, and new product launches for pharmaceutical waste disposal are expected to drive the global market during the forecast period. On April 2017, Stryker announced the acquisition of Cactus, LLC, a manufacturer of Smart Sink, Pharma Lock, and Pharma Lock OR controlled substance waste management systems.